A hemangioma is a birthmark caused by a stack of blood vessels on or just under the skin. Hemangiomas generally appear on the face and neck and can be many different colors, shapes, and sizes. Nicholas Bastidas, MD, offers treatment for your child’s hemangioma in the NYC area. Not every hemangioma requires treatment, which is why you should always consult with us to determine the best course of action. A hemangioma is not cancerous and may recede as the child grows, often fading entirely by the time your child is 10 years old. However, a hemangioma is physically unattractive and can cause complications with vision and breathing. You can spot a hemangioma from its typical rubbery, bright-red appearance. The hemangioma grows rapidly throughout the first year of your child’s life, becoming a spongy and protruding mass. We monitor the hemangioma and discuss with you the treatment possibilities. We recognize that your child’s physical and emotional health need to be taken into account as we determine the best method for treatment. Cavernous: a hemangioma made of slightly larger and widened blood vessels and in which the extra space is filled with blood. Capillary: a hemangioma made of stacks of tiny capillaries. Compound: a combination of a cavernous and a capillary hemangioma. Lobular capillary: a hemangioma on the hands, face, or arms composed of a large number of small blood vessels, which bleed very easily. 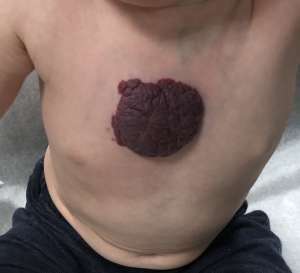 We recommend hemangioma surgery for cavernous and compound hemangiomas and generally resolve capillary hemangiomas through nonsurgical treatments. If you believe your child has a hemangioma, come to Nicholas Bastidas, MD, in the New York, NY, area. Call 516-497-7900 or 212-485-0616 to schedule an appointment.